BeckenRidge Vineyard – A wonderful place for weddings, private events, parties, celebrations of life and business meetings. BeckenRidge Vineyard was specifically designed for weddings, receptions, and special occasions. The panoramic view of the Willamette Valley and the Cascades provides the perfect backdrop for your special day all year-round. Spring, summer, or early fall, BeckenRidge harmoniously combines the outdoor ceremony with the indoor reception. Indoor seating accommodates up to 120 guests at tables, or expand your seating to the adjoining patios for a total of 250 guests. Walk down a stone path for your ceremony on the lawn that touches the vineyard and spaciously accommodates 250 guests. If you would like your ceremony to be covered, you may either use the covered patio for 110 guests or rent a tent for the lawn. For winter and late fall, cozy up to the warmth of the stone fireplace for your reception or ceremony with up to 120 guests. 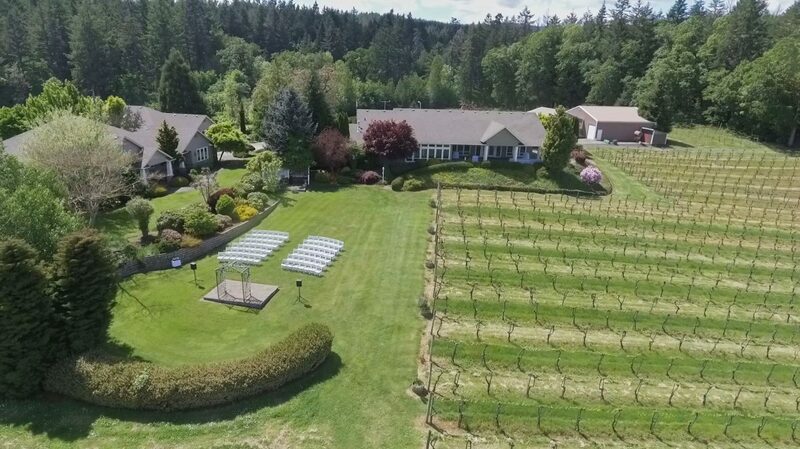 If you prefer the panoramic view of the Willamette Valley and Cascades as the backdrop to your ceremony, you may use the covered patio which seats up to 110 guests (patio heaters available for rent), then bring your guests inside for the reception. With 12 acres of vineyard wrapping itself around you and your guests, you can’t escape the romance. The views of the vineyard, valley, and Cascades never stop, whether you are on the patios, inside, or on the lawn. Your photos will create beautiful memories, taken in the vineyard and the many other picturesque locations on the property. Decorating is made easy be the casual elegance of BeckenRidge, which includes a stone fireplace, grand piano, and a hardwood floor. The lawn area is beautifully landscaped and includes a stone platform with a custom handcrafted arbor, which is perfect for your ceremony.